This durable, arterial colored jam-like texture simulates coagulated blood for wounds, lacerations, and abrasions. "Scrape" along skin with a stipple sponge for an abrasion or road rash. 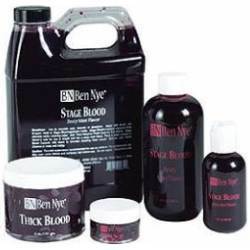 Makeup artist Ben Nye, Jr. used it throughout the John Grisham thriller, "A Time to Kill". A must for mass casualty scenes and disaster training exercises. Excellent adhering quality for durable special effects. Washable. Sizes available: .5oz., 1oz., 6oz. and 16oz. Expect approx. 5-10 applications per ounce.